In the following table of the diatonic scale and intervals, the breadth of the latter, both pure and tempered, is expressed in hundredths of a tempered (piano) semitone, the tempered in parentheses. This is the unit of interval measurement proposed by A. J. Ellis, and called by him the cent. The ratios are those of the vibration numbers of the component tones of the pure intervals. 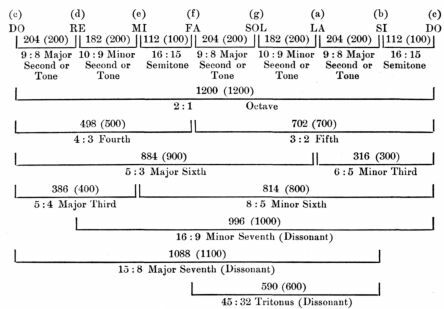 The word trichord is hereafter used by analogy with tetrachord, to signify a combi�nation of three notes spanning the interval of a fourth or less: and the word tetrad by analogy with triad, to signify a combination of four notes spanning the interval of a fifth or more. A trichord or triad is called major or minor according as the lower interval is the larger or the smaller. The extremes of these combinations are called summit and base, the intermediate note or notes, the axis or mediants. The sign + or � after a letter, or combination, signifying a certain pitch, denotes a pitch slightly above or slightly below. The symbolism of the notations is more fully explained on pp. 53 f.